The biggest challenge of any out of town activity in Saudi Arabia is simply getting there. For this trip, we rented a car from Sixt. It was a basic automatic, white 2017 Hyundai Accent with only 1,467 km on the odometer...yet it still had scratches and gunked up adhesive residue from the shipping stickers. 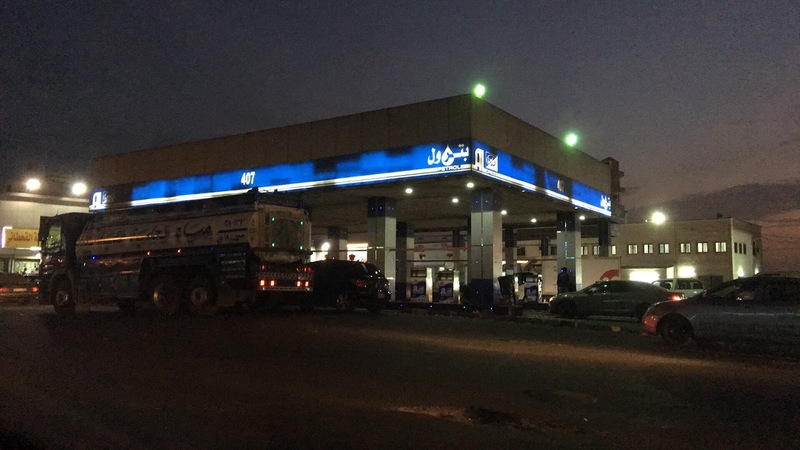 However, since gas is so incredibly cheap here, it only cost 15 SAR ($4.00 USD) for a half tank of gas (250km range) that covered the whole trip. 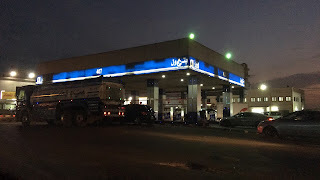 We drove to the designated meeting point at a highway gas station on the south end of town to wait for the rest of the tour group that was coming down from King Abdullah University of Science and Technology (KAUST). We got there around 6:10 pm for a 6:15 pm meet-up. We parked between the off-ramp and the highway so we could see their "red bus with German writing on it" and pull out behind them. They had called on our way in and said that they should be here in 15 min. 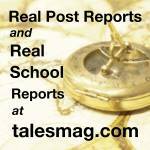 With that much time to spare, Greg darted across the highway off-ramp to find a bathroom. Yeah, that's right. A Saudi highway truck stop bathroom, for when you've really gotta go. While we were waiting, we also got blocked in by two or three vehicles, so we re-positioned our car so that we were actually sitting on the side of the off-ramp (behind several other vehicles doing the same). The bus arrived at five minutes past 7 pm. Which, given the traffic and Saudi Arabia in general, isn't too shabby. It was easy to follow the big red bus south through two checkpoints (where no one checked anything). The only thing interesting we saw during our night drive south were signs counting down the distance to Yemen. I think the last one we saw put us around 600 km north of the border. We arrived at the resort at 9:35 pm. Now, when I say "resort," you might be thinking of a place like the Shangri-La in Muscat, Oman. But this place was much more like a nice dive camp, because most Westerners wouldn't come here as the final destination to just hang out at the resort. We got the kids to bed and then Greg chatted with our tour guides while the group was waiting for the shawarma dinner to arrive, which happened to be around 10 pm. After dinner, it was straight to bed, as we had a 6 am breakfast call to be on the boats at 7 am. Today is the first day on the water. Greg's alarm was set for 5:20 am, but the call to prayer came on at 5:14. Breakfast was a simple buffet, and the girls loved having Nutella on their pancakes. We were aboard the "Dream Island" right around 7:00 am. Our boat is behind this futuristic looking vessel. Even though we got out on schedule, we had to stop by coast guard station on way out, as the two zodiacs in tow hadn't been cleared to leave port, so that caused a slight delay to sort out the paperwork. The morning was overcast, and the water was calm. Overall, pretty enjoyable for today's activities out on the water. As whale sharks feed in the morning, we were told to have our gear ready to go just in case we came upon some activity as we headed out to the reef. So the kids were walking around the boat in their wetsuits and life jackets with big smiles on their faces looking for whale sharks. Pretty adorable, really. 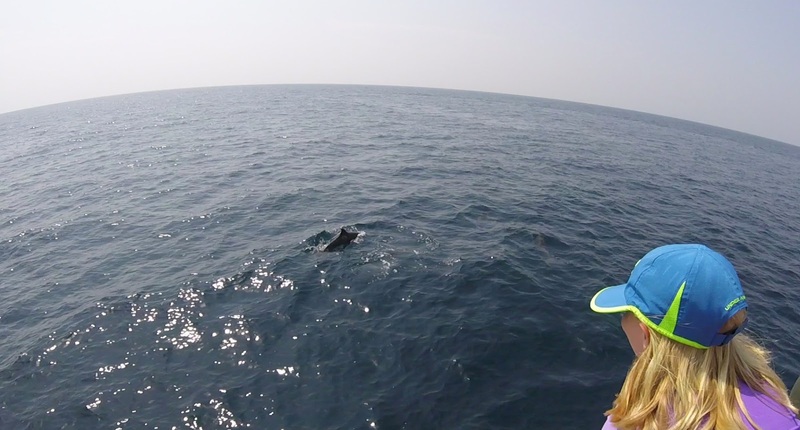 A little bit about our tour organizers: On the trip out to the reef, we learned quite a bit about whale sharks and the aggregations (groups) in the Red Sea. 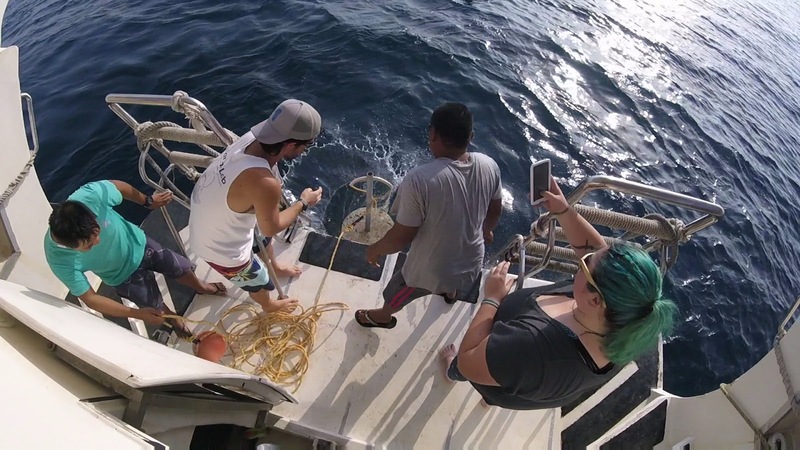 Our tour operators, Alex and Jesse, and several other staff are mostly PhD students or graduates affiliated with KAUST and focused their studies on either whale sharks or marine life. The lead researcher was the azure-haired PhD student named Royale. She had some pretty awesome whale shark patterned swim gear, and one of the guides also had a whale shark patterned head band. As long as I'm throwing out references, also check out @simonjpierce on Instagram for lots of high quality whale shark pics. While the boat crew is focused on operating the boat, the grad students studying the whales are also supporting the tour, so they are doing double duty with all the organizing and researching. When they pulled up one of the research station radios to replace the battery, they also looked at what was growing on the line. Turned out, there was a frog fish that somehow stayed with the line as it was pulled on board, so he ended up in a little tupperware bowl so the kids could see it. We continued to troll the middle section of the reef until 11 am, but didn't see any whale sharks. The sensor that they pulled up had not recorded any visitors near that spot since June 16, but I'm not sure if the battery died somewhere in between. The whale feeding time is over for the morning. The sun started to come out, and our kids got hot. Too hot. The combination of wearing a wetsuit out of the water since 7 am, under an increasingly warm sun, while experiencing a slight chop on the water ultimately made our younger daughter nauseous and she threw up in the salon. We missed the sensor data download because I was cleaning up vomit. Fortunately, it worked out far better than when her grandfather got seasick during our dive trip to Yanbu this time last year. 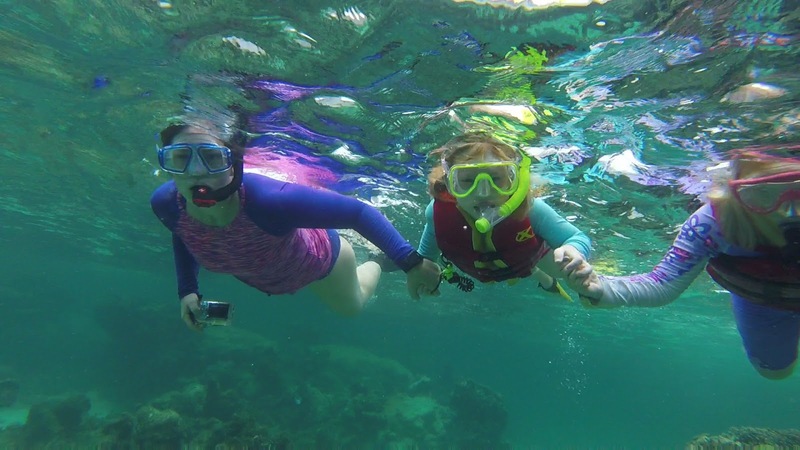 Since the reefs the whale sharks hang out at are a little deep, we went to a shallower reef to snorkel. Fortunately, the kids felt better now that we they were out of their wetsuits so it was fun for everyone. The reef was near a small, deserted island. The snorkelers went out first, followed by the divers. 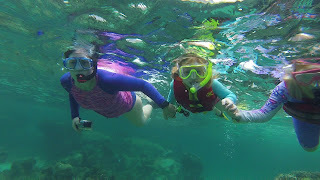 Even though we were snorkling, we saw a small moray eel and a blue spotted ray at the bottom of the reef. I think it was between 10-30 feet deep in most areas of the reef. Kacey free-diving to get some good photos. After our snorkling, we were served a lunch that consisted of rice, chicken, and lumpia. As the crew was Filipino, they knew how to make this food and it was very tasty. Lots of biscuits (cookies) for desert. We napped topside listening to beachy music like Israel "Iz" Kaʻanoʻi Kamakawiwoʻole and Jack Johnson. It was sunny, yet the breeze kept us cool while we listened a Spotify beach vibes playlist one of the guides had downloaded before the trip. It was totally perfect. Drying off under the Saudi sun after lunch. After lunch, we headed north to troll the north reef, but we didn't see any whale sharks today. We stopped back in to the Coast Guard station to confirm that we weren't smuggling anything into the country. Dinner at the resort was good, can you really have too many Filipino rice and chicken dishes? I don't think so. Straight to bed to get sleep for tomorrow. Somehow, we overslept. Greg woke up first at 5:40am. Fortunately, we still didn't have to be at the boat until 7 am, so there was still enough time for a somewhat leisurely breakfast in our swimgear. We had to check in with Coast Guard again, but this time all the paperwork was in order and we were on our way to whale shark reef around 7:40. En route, we dropped a new concrete mooring for one of the research components. A zodiac had gone ahead to find the spot where the old one was and pulled up the old unit to give to us after we swung by and dropped the new stuff before continuing onward. Over the radio, we heard there was a whale shark sighting with 3 mantas, but they dove away before we could get over there. 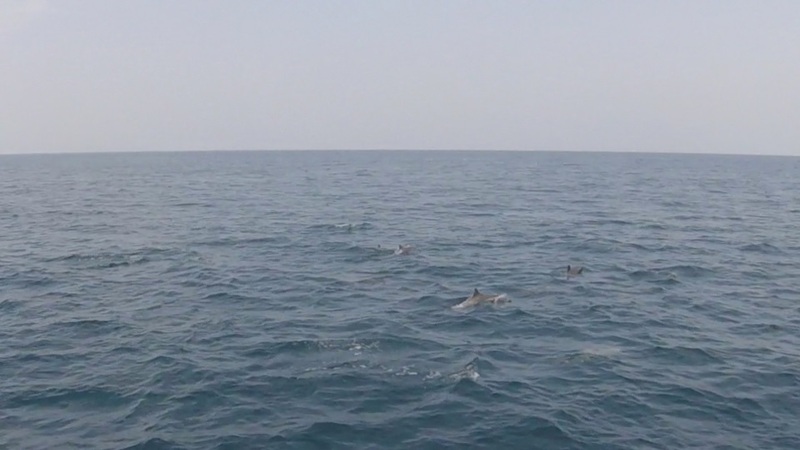 A bit later, we were joined by a large pod of dolphins (~10+) on our bow. They seemed like they would stay nearby, so we got in the zodiacs to go swim with them...but they disappeared. We came back in after 10-15 min of looking. 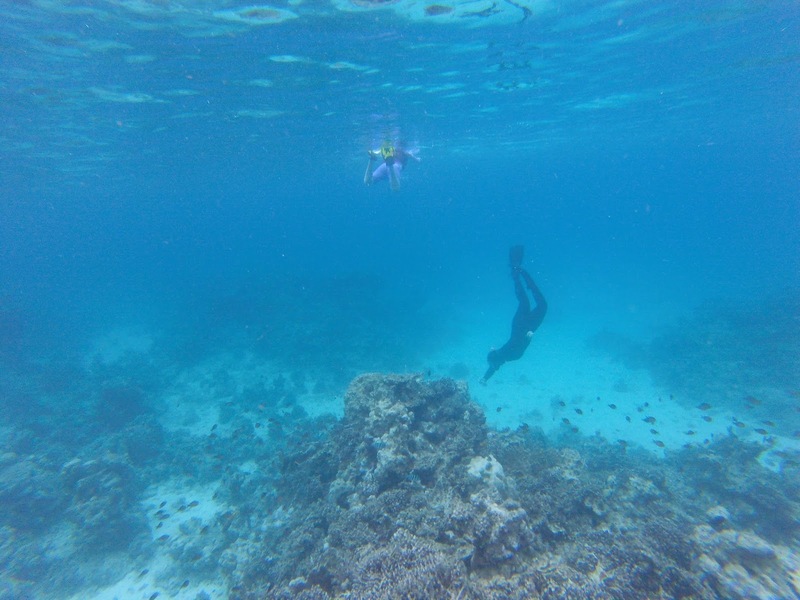 We pulled up beside fairly shallow reef and boarded a zodiac to bring us in even closer. While exploring the reef, we saw two more spotted rays, another moray, and all sorts of other sea creatures. We climbed back into the zodiac (which is always fun) and motored back to boat. Once aboard, we dried off and had lunch: rice, sweet & sour chicken, and chicken adobo (and more lumpia). Kacey went for a dive while Greg stayed aboard with the kids. Today's snack was popcorn, in a big bowl roughly 18 inches in diameter. Kacey came back from her dive and our kids were now playing hide and seek with 3 other kids on board...but there are just not that many places to hide on a little boat, so they were hiding behind people on the salon couches. Just after 4pm, a reef manta ray surfaced right next to the boat. In the commotion to run out and see it, the popcorn got spilled all over the floor. The kids had fun cleaning that up. As the daylight was starting to run out, we turned back towards the marina to call it a day. On the way back in to port, we were escorted by a rather large pod of dolphins. We even saw one that was almost in the harbor, which is kind of rare. So, sadly, no whale shark sightings this weekend. Our guides said it was the first time they've gone the whole weekend during the season without seeing a single one. There was conjecture that it might be due to colder weather this year, so the animals are shifting things a little later. Another theory was that the fighting around Yemen might also be disrupting migrations, but that's harder to confirm. We were back at the resort around 6pm. We had already packed must of our stuff into the car, so we were on the road home at 7 pm after showing and eating a quick dinner. The two and half hour drive home was uneventful, except for a checkpoint south of Jeddah that was backed up. We picked the far right lane, and it turned out that of the three lanes, only one had an officer checking paperwork. It might have been prayer time, but it wouldn't surprise me if it was normally understaffed. He was in the middle lane, so we breezed through the checkpoint without being checked.